Hi, Connie here with another outdoor scene for you. My nephew just got back from taking his family to Tennessee for their vacation, so I decided to do a little scene that might remind him of that trip for his Birthday card. I went about die cutting the Poppystamps Thicket frame from a piece of glossy paper that I applied Adirondack Alcohol inks in Ginger, Sunset Orange and Lettuce. I decided to use the same applicator and just add a bit more Lettuce alcohol ink to it onto another glossy paper to make the grassy hills, using the Poppystamps Stitched Landscapes dies. I was able to cut out both hills with one piece by having the cutting edge of the dies facing each other, the only part wasted was that thin strip in the middle. 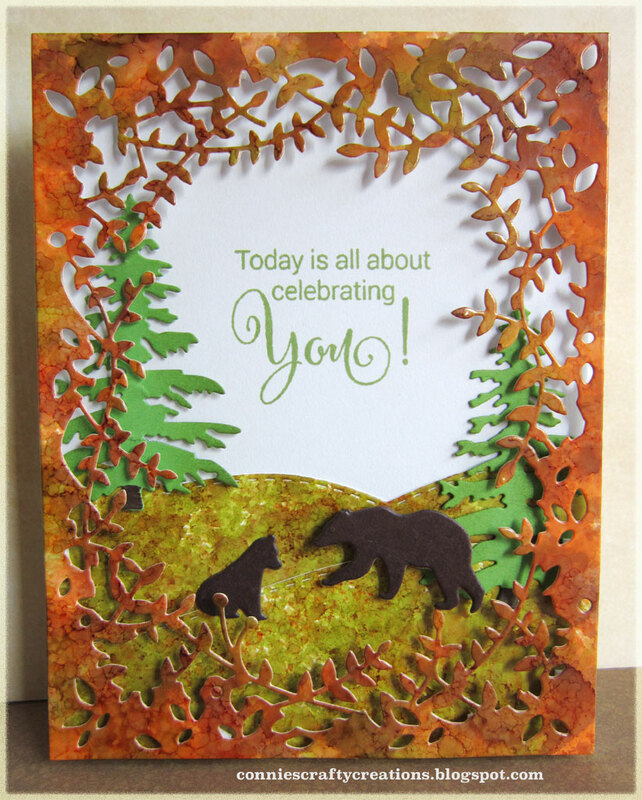 I then cut out two Frantic Stamper Small Oregon fir dies out of green cardstock, colored the trunks with brown marker and then did a little bit of shading with some Pealed Paint Distress ink. 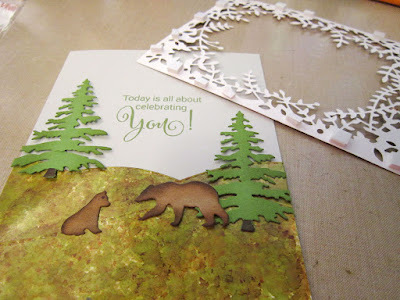 I also cut the Poppystamps Mama and baby bear dies. 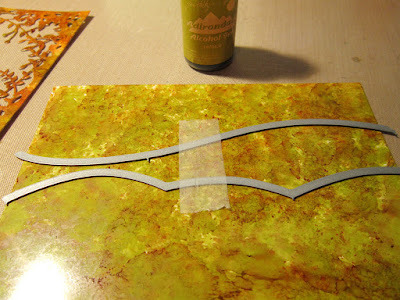 Here is a close up before adding the thicket frame with foam tape for dimension. As you can see in this picture I had done a little shading on craft cardstock for the bears, but as you can see in the final picture I ended up cutting the bears out of all brown cardstock, I think it helped them jump out a little more from the scene. The sentiment is from Penny Black -- Sprinkles and Smiles stamp set. The following are pictures of the dies I used with the links above in the description. Awe what a beautiful Autumn scene. Love how you did the leaves. Must make a note to use glossy paper. Great tip. Awesome job on the coloring for the Bears. Fabulously created. What a beautiful card Connie, with a gorgeous scene. 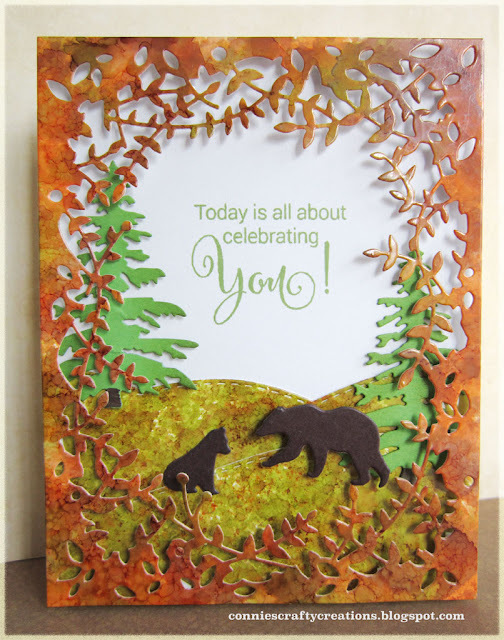 I love the Autumn colours and the thicket frame is perfect for the bears! Great tip re the glossy paper too. WOW What a fabulous scene you have created Connie! And the rich fall colors are perfect and thanks for the tip! Great job! 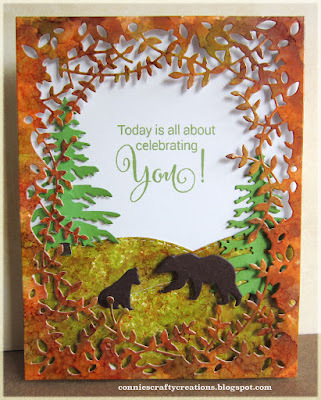 Oh your alcohol inks look amazing, especially cut with that Thickets die, isn't that glorious??? AND your rolling hills are a perfect.....if those bears weren't there I would be looking for Julie Andrews spinning round! Love your Fall card, as will your nephew! Isn't it great how alcohol inks look like veins in leaves when you use a blending tool and glossy paper......gorgeous frame. Love those hills too. Wonderful card. Wow, Connie! You have created such an elaborate scene - one of beauty and love! Thanks for showing the AI's with dies, and for giving me more ideas for those frame dies! It's a true work of art! This is so pretty! 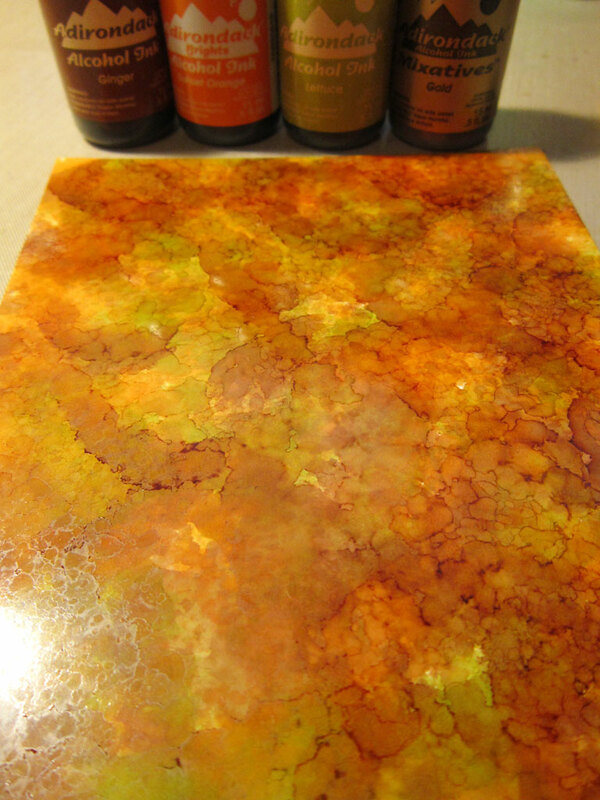 The alcohol ink backgrounds were amazing! I would have had a hard time cutting into them but you did a fabulous job!